Castle Party Rentals of Elgin gets Extreme, Team Building, Extreme Sports, Extreme Games, Extreme Rides, with Elgin Party Rentals, you can chose how extreme you want to be: Experience the thrills of weightlessness as you achieve heights of up to 40 feet with our Chicago Euro Bungy. Try to survive the most extreme mechanical bull ride ever made. Our mechanical bull resides on an Elgin farm and loves to be ridden. We even have the Tallest Rock Climbing Wall In Illinois! Our State-of-the-Art 32 foot tall 4 person climbing rock wall with an extreme overhang will make a great attraction rental. If you are looking for extreme fun and something unique, the Euro Bungy is it. This attraction was imported from Europe, hence its name but is quickly becoming extremely popular in the Chicagoland area. Children, teens, and adults can defy gravity as they bounce upon the trampolines and free fall through the air. If you have never been on a Euro Bungee, you are really missing out! It's a great experience and is highly recommended if you would like to take your event to the next level. Please let us know if you have any question about our newest extreme attraction. We are the home of the Mechanical Bull. 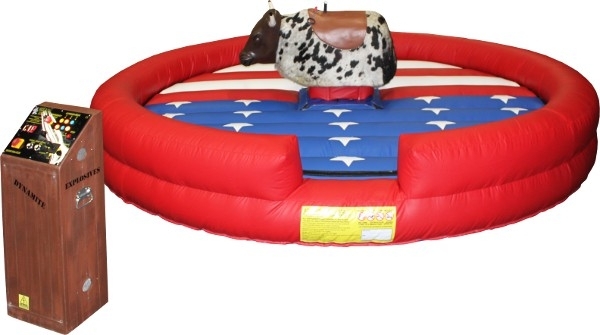 For the ultimate in interactive fun, try to tame the Mechanical Bull. Our bull has all the latest safety features to ensure a great rexperience. From young children, to grandparents, Castle Party Rentals is sure to bring out the cowboy/cowgirl in your guest and create an extremely enjoyable environment. Our Mechanical Bull Ride plays music as well as keeps track of how long you can stay aboard the bull without being bucked off. We can setup this Bucking Bull indoors or outside. mechanical surfboard at your next event and you can be guaranteed a very memorable party. This is the tallest rock wall in Illinois! Bigger is simply better! Why settle for the smaller walls when you can have the tallest wall available? There is 4 separate climbing lanes for different skill levels and a 4 foot overhang for those extreme climbers. Please also note that we carry a 24' tall wall that is inflatable which may be more appealing for the younger children. If you are looking for that signature attraction at your next event, make sure to consider a rock climbing wall rental. All aboard the trackless train! Our train is a realistic version of a real train. These trains has a whistle and a bell to ring, that we allow the children to ring. Since this train is "trackless", it can go just about everywhere... cement, asphalt, grass or pavement surfaces. An ideal location would be a parking lot or a residential street. We also have a smaller train that is white in color. Our trackless train rentals come with an attendant to drive the train around for the duration of your party, which assures child safety and enjoyment.